Coordination within physiological systems, particularly those systems known to be responsive to the social environment, such as the stress response systems, has become increasingly viewed as a way to index bidirectional social information processing within close relationships. Most studies have focused on coordination of stress system responding within mother–child or romantic dyads. These studies have demonstrated that adrenocortical attunement, or coordination within the hypothalamic-pituitary-adrenal (HPA) axis, is predictive of relationship quality and sensitivity. Mother–infant attunement is predictive of emotional regulation and outcomes associated with resilience later in development. Very few studies, however, have examined attunement within the entire family, specifically neglecting to examine fathers’ coordination with their children and partners, and how that may influence child outcomes. 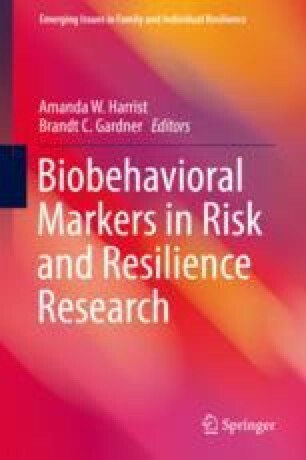 We also know little regarding the predictive factors and outcomes of physiological coordination in at-risk populations. We argue that examining physiological attunement within at-risk families can serve as a vital biomarker that signals important developmental outcomes. Importantly, changes in family biomarkers could be used as an unbiased index of the effectiveness of intervention programs. We discuss the information this perspective is likely to yield and its ability to promote resilience within families. Ellis, B. J., Jackson, J. J., & Boyce, W. T. (2006). The stress response systems: Universality and adaptive individual differences. Developmental Review, 26, 175-212. https://doi.org/10.1016/j.dr.2006.02.004. Liu, S., Rovine, M. J., Cousino Klein, L., & Almeida, D. M. (2013). Synchrony of diurnal cortisol pattern in couples. Journal of Family Psychology, 27, 579–588. https://doi.org/10.1037/a0033735. Stearns, S. C. (1977). The evolution of life history traits: A critique of the theory and a review of the data. Annual Review of Ecology and Systematics, 8, 145–171. https://doi.org/10.1146/annurev.es.08.110177.001045.